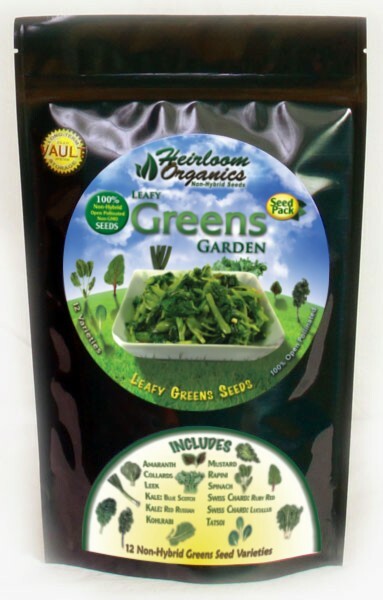 The Heirloom Organics Non-Hybrid Greens Pack is a collection of some of the most nutritious greens available. Providing a high concentration of nutrients with fast-growing, easy-to-grow varieties for fresh eating in green salads or as excellent cooked vegetables. The Heirloom Organics Non-Hybrid Greens Pack even includes Amaranth (a highly nutritious vegetable leaf from South America, often grown as grain as well). The Greens Pack contains 12 varieties of the most nutritious greens. Amaranth is a broadleaf plant that could be mistaken for soybeans early in the growing season by someone driving past a field. Late in the season, however, there is no mistaking this striking, tall crop which develops brilliantly colored grain heads producing thousands of tiny seeds. Amaranth was a major food of the Aztecs and earlier American cultures, having been domesticated thousands of years ago. Rapini or broccoli raab (also spelled broccoli rabe) is a green cruciferous vegetable. Its edible parts are its leaves, buds and stems. Broccoli raab has many spiked leaves that surround clusters of green buds that resemble small heads of broccoli. The small yellow flowers that bloom among the buds are edible. Broccoli raab is known for its slightly bitter and nutty taste, and can be associated with Italian and Portuguese cuisines. It is a good source of vitamins A, C, and K, as well as potassium, calcium, and iron. Chinese Tat Soi Cabbage is a vigorous, fast-growing Asian vegetable. It has a very pleasant and unique flavor. It is often confused with Pak Choi and Bok Choi, which are shorter and thicker-stemmed, and have a less concentrated flavor. The leaves of this plant are dark green and spoon-shaped, and form a thick rosette. The leaves have a soft, creamy texture. Chinese Tat Soi Cabbage is suitable for Asian dishes, and complements the flavors of Asian condiments. One of the most nutritious of all greens. Collards are extremely popular in the South, and their popularity is growing rapidly in all other regions. Plants are easy to grow, tolerant of heat and cold and very rich in vitamins and minerals. The juicy leaves are delicious boiled, steamed, or as an addition to salads. A cold hardy delicate, flavorful variety of kale. Its leaves are frilly and oak leaved in shape and red veined, greenish purple in color. Ideal for fall crops. Enjoy its greens fresh in salads or steamed and stir fried alone or with other vegetables. This heirloom garden kale has finely curled, blue-green leaves. It is compact and very attractive, as well as highly nutritious. It is used fresh in salads, on sandwiches and steamed cooked. This variety better withstands colder weather than other varieties. Kohlrabi is a hardy biennial member of the cabbage family. It was first recorded being grown in northern Europe in 1554, and had reached North America at least by the early 1800's. The name is a German word meaning cabbage (kohl) - turnip (rabi), describing the turnip-like enlargement of the stem above the soil. Leaves stand out like spokes from the edible portion, the rounded stem section, which is commonly referred to as a bulb (even though botanically it is not a bulb). Although it is quite exotic looking, it is merely a different horticultural form of the same species to which common cabbage, kale, broccoli, and cauliflower belong. Its flavor is similar to that of turnips but milder and sweeter. The Large American Flag Leek is a non-bulbing member of the onion family. Leeks are cold-tolerant and can be left in the garden into fall for an extended harvest. Large American Flag Leeks have a sweet and mild taste, and are gentle on the digestive system. They play the role of onion in culinary dishes, but their flavor is toned down by comparison. Calorie for calorie, leafy green vegetables like spinach with its delicate texture and jade green color provide more nutrients than any other food. Spinach is becoming more popular as evidenced by increases in consumption of both fresh (salads) and processed spinach. It is high in vitamins and minerals. Spinach reaches edible maturity quickly and thrives best during the cool, moist seasons of the year. During periods of warm weather and long days, spinach will produce seed. This cold-hardy crop can with-stand hard frosts with accompanying temperatures as low as 20 0F. Spinach can be overwintered for early spring production in many areas of the state. Lucullus Swiss Chard is named after the Roman general of the same name. Leaves of the Lucullus Swiss Chard are heavily crumpled with wide, broad white ribs. Lucullus is heat-tolerant and grows until first frost. It is a heavy producing plant with good flavor. It is an excellent source of vitamins A and C, and will add delicious flavor to any dish. Ruby Red Swiss Chard is a sweet Swiss chard with candy-apple-red stalks, and dark green, crinkly leaves with touches of red. Because of its vibrant colors, it is often used in ornamental beds, or for colorful borders in gardens. Although Ruby Red Swiss Chard is related to beets, the root is inedible. The leafy greens are valued for their mild flavor and high nutritional value.